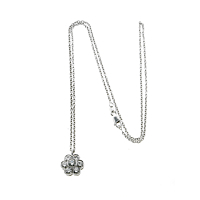 Van Cleef & Arpels Diamond Flower Necklace will let you exhibit your whimsical side. With an 18-inch chain, the necklace flatters your neckline since it drapes to the middle of your chest. Because of the jewelry item's subtle inclusion of seven round brilliant-cut diamonds, you can wear the necklace to the office or a night out on the town. 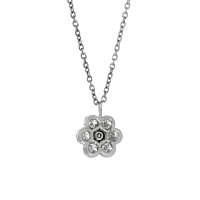 In addition, the necklace's diamond pendant is formed in the shape of a flower to give the piece a classic appearance that you'll enjoy passing down to your children as an heirloom or wrapping up as a gift for a loved one.